What do science, espresso, and beer have to do with each other? Weizmann scientists and students have news for you. What do science, espresso, and beer have to do with each other? Quite a lot, if you ask the scientists and students of Rehovot's Weizmann Institute, who have brought news from the front lines of scientific research to local venues. 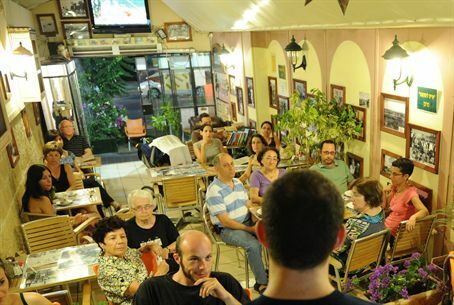 To help celebrate the 120th anniversary of the city of Rehovot, research students and Institute scientists, in partnership with the municipality, ventured out to the city’s pubs and coffee shops to meet with the public and share their experiences on the front lines of global human knowledge. "It was loads of fun. The crowd really participated," Professor of Mathematics and Computer Science Irit Dinur told Israel National News. "If there was a criticism, it was that people said that the events, which all took place at the same time, should have taken place one after the next to enable people to attend more of them." As a female professor, Dinur talked about Women in Science. "I discussed what types of things we can do to bring more women to science, and to promote women who are in the field to higher levels. I think we need to strengthen education and policy to encourage women to enter and succeed in the sciences." Physics teacher Dr. Ranny Budnik said, "I spoke about Dark Matter. What is it? How do you deduce that there is Dark Matter in the universe and eventually how will we detect it? I explained that Dark Matter is matter that doesn't interact with normal matter except for gravitation. There should be Dark Matter around us, through our bodies, in space, but it just doesn't interact with us." When asked if he thought Dark Matter exists, Budnik replied, "I think it does. Many independant evidence shows this. It's a simple solution to many problems we have in Astrophysics, Cosmology, and High Energy Physics. When there is one answer, that explains a lot of phenomena then it's often the correct solution." "The people I spoke to were very interested in the subject 'matter'," said Budnik. "The cafe was sold out. They booked days ahead fo time. After a 15-minute lecture, we had a full hour of questions and answers. The constant feedback from the audience makes you understand what's really on their minds. People of all ages came out, from 13 to 60." Institute President Prof. Daniel Zajfman got pub-goers in the Kiryat Weizmann Science Park pondering the possibility of life on other planets. Vice President Prof. Israel Bar-Joseph, meanwhile, held a discussion on science education, together with Rehovot Mayor Rahamim Malul, in one of the colorful coffee shops in town. In other establishments around town, crowds came from Rehovot and beyond to have a beer or espresso and hear research students explain the subjects that engage them on a day-to-day basis. The evening opened with a “happening” for children: Nano Comics, Science and Good Spirits,” based on the comic series that, in turn, is based on scientific research at the Institute. In addition to the display of comics, including larger-than-life cardboard cutouts of the Nano Comics characters, there was a creative workshop led by research students Tal Shapira, Vered Tzin, Idan Efroni and Yotam Asscher, together with the Nano Comics writer and illustrator Meir Goldberg and Yaniv Shimoni. Especially popular was the session on the personal story of Nobel Laureate Prof. Ada Yonath, which recounted the challenges she face in her long research career and her perseverance, which eventually led her to receiving the Nobel Prize in Chemistry in 2009.